Very likely a reference to Crowley’s Moonchild and the Stones dabbling and sympathies with the devil, this song was recorded just after the Rolling Stones’ had released their album, ‘Their Satanic Majesties’, and continues the theme. It was the B-side of the single release, ‘Jumpin’ Jack Flash’ (clearly a devil-child). The front story for the character of Jumpin Jack Flash is that he was named after a gardener. 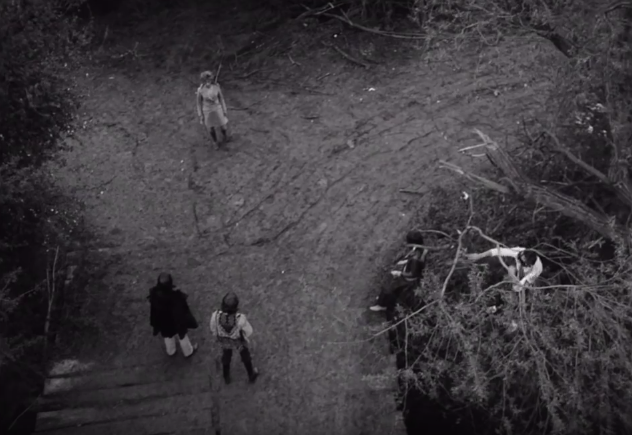 The events, practices, and fall-out around Brian Jones‘ death are certainly very odd, and eerily pertinent to the video of ‘Child of the Moon’ (watch the video below). 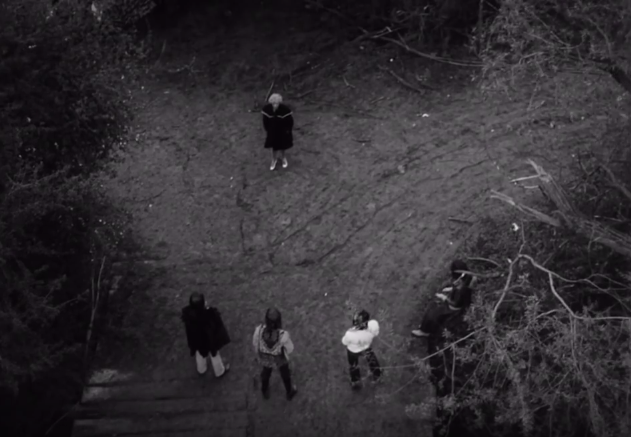 Was Brian Jones’ strange death Satanically scripted and subtly, unknowingly, notified in the video of Child of the Moon? The Stones stared a little too long into the abyss. …And did they call up something they could not handle? Child of the Moon, a video made for the song by the Rolling Stones was directed by Beltane-born, Michael Lindsay Hogg. I have used both the archetypes and real names of the characters interchangeably in this article for flow and ease of understanding. I am not making allegations against any person or organisation mentioned in this article. The main focus has Jagger, Watts, Wyman and Richards together. The scene is a wooden bridge on a wet and muddy country track in winter. Richards is sitting in a tree (trees symbolise stars). He is the lead guitarist. Lead is spelled the same as the metal, lead. Lead is a symbol of Saturn. He, Wyman, and Watts can be connected to Saturn in this tale. Wyman (bass – base) leans against what looks like a milestone (a journey and an indicator of intention and objective, the future), but may be a wooden post, or stake. A go-between, ferryman character perhaps. Watts, the drummer, stands in the middle of the bridge (a crossing). He represents time and the control of it. The characters are clearly waiting for something, and to interrupt its passage. Other than the band we have a white horse (representing the sun, and the Light) and a boyish-looking child in girl’s dress (virgin moon), a young woman in white (almost the full moon – the potential mother, the fertile woman in this video), and an elderly woman (the Crone moon). The moon aspects enter the scene down a staircase. There are, as well, markings on the ground representing the 3 phases of the moon (a month), in strange order. In the video Jones only appears 3 times too, never as part of the band. The moon is approaching through the darkness, through the trees (the cosmos), and is first observed as the virgin moon, a fair-haired child of indeterminate gender, except for its dress. The child’s hair is the same colour and type as Brian Jones’, only shorter. The youngster, the younger Brian, smiles innocently. Brian Jones observes from behind a tree. The band on the bridge are shown. Wyman, disinterested, like he’s seen it all before perhaps. Watts non-animated. Jagger though, projects a creepy desirous and expectant expression of desire and mentally goads the innocent forward. The child is briefly aware that something is not right; its smile turns to puzzlement, but being unworldly and confused the youngster’s cheerfulness quickly returns before it runs off. Brian Jones retreats back into the shadows of the tree. Next comes the fertile woman who, unaware, approaches the bridge, and is noticed by Jagger and Wyman; and watched from behind his tree, Jones. Jagger is singing, “She shivers, by the light she is hidden”, but it sounds like the word ‘tethered’ is being sung at the same time (1:11-12). Watts is now alert. It’s time. 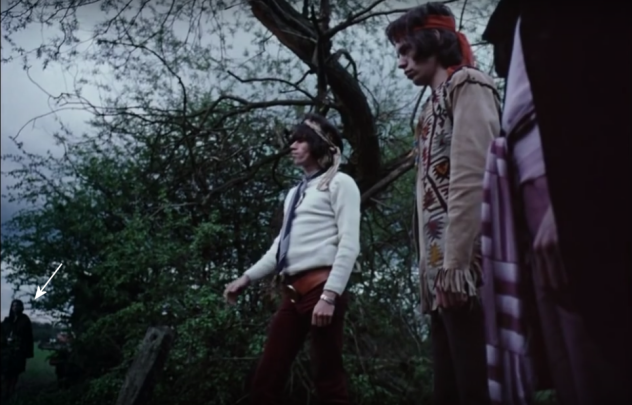 The woman is confronted by the devilish character and time, Jagger and Watts, Richards jumps from the tree. Wyman has gone from his perch – her intended course, her cycle, her life and life-nurturing role, is now uncertain. * She, however, by implication, is now seeing the five stones (Jagger, Watts, Wyman, Richards and the milestone, not Brian Jones). Jones’s face briefly emerges from behind the tree but he remains out of sight, and the site. She hesitates. Is he psychically alerting her to the danger? She is startled, uneasy, and remains standing on the waning moon inscription – rather than being fertilised by the apparent Light. Richards jumps from the tree. He wears a watch; Richards and Watts are integral to each other (Saturnian aspects). Wyman is non-committal. Jagger prepares himself for the moment. The woman comprehends his intentions, turns and flees the scene. Jagger’s expression shows he knows that he has failed. Earlier, at the beginning of the video, he is seen mirroring the moon’s entrance from the darkness by walking from the sun (the horse). It is evident, he represents something she is unwilling to consort with to bring forth a child – Lucifer, the light-bringer. Brian Jones fades back behind the tree. The moon, as the fertile woman, wiser, relieved and not pregnant, walks away. But…really, what had happened is that Lucifer had sussed the deception. An illusion has taken place. The old woman wasn’t who she appeared to be, or all she appeared to be; the moon goddess is one who shows 3 aspects. The moon cannot move through time from its first phase to its last without passing through its Full Moon, its Motherhood. We don’t see it but we do see the Lucifer character return and then the young woman stumbling in a distressed state. The suggestion is that she has been raped. The return to the bridge, to the same scene, relates the recurring story of the moon and her cycles from an occult and I would suggest, dark Luciferian perspective. It portrays Lucifer as the dominant force. Within a month of Brian Jones’ departure from the Rolling Stones, he was dead. Eileen Atkins, bears the initials E.A., which as EA is Enki, who is Lucifer. There’s reams of lunar-related associations with Lewis Brian Hopkin Jones. He was born 3 days before a full moon, and died 3 days after, and when the moon was high. The name Brian means high. The surname Jones (from ‘John’) is easily related to the moon. As Lewis Jones, his parents associated him with the term given to the son of a Mason. 3 is the number of the child. 28, his birth day number is a lunar number. Also see this reference to A Lewis whose real name was John Hogg. Read the Wikipedia page about Brian Jones’ death. He even died at the former home of Billy Moon, A.A. Milne, the author of Winnie the Pooh. Mick Jagger quoted from Percey Shelley’s Adonais at a concert held on the Crone moon, 5th July after Brian Jones’ death, dedicated to him. The morning star is widely personified as Lucifer, for those who don’t know. This entry was posted in Alternative Investigations, Crime, Ellis Taylor, magic, music, Mysterious, Numerosymbology, Rituals, Sacrifice, Uncategorized and tagged adonais, brian jones, child of the moon, crowley, lucifer, milne, moon, moonchild, rolling stones, saturn, shelley. Bookmark the permalink.